Pictures by Erich Lessing, probably Austria’s most famous photographer, went around the world. His legendary photo of Leopold Figl and the foreign ministers of the allies at the signing of the Austrian State Treaty on the balcony of the Belvedere became an icon of the new Austria. His portraits of prominent representatives of the arts, such as actor Helmut Qualtinger and conductor Herbert von Karajan, and pictures of great politicians, for instance Nikita Khrushchev and Konrad Adenauer, made him world famous. Erich Lessing, the photographer, passed away on 29 August 2018 at the age of 95. Erich Lessing, born in Vienna on 13 July 1923, was the son of a dentist and a concert pianist. In 1939, he emigrated to Palestine, studied radio engineering in Haifa and worked as a carp breeder in a kibbutz. He was given his first camera at the age of 13, and the hobby of his youth went on to become his profession. Following his return to Austria, he began work as a photojournalist for Associated Press in 1947, became a member of the agency Magnum Photos and covered the events of the Hungarian Revolution of 1956 with his camera. 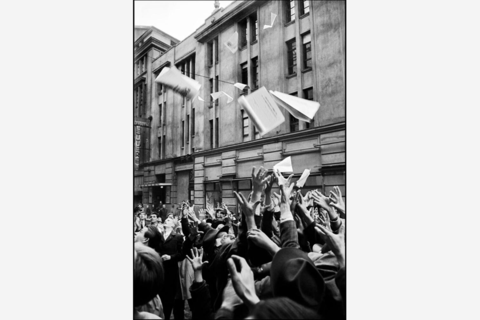 In 1956, in Budapest, he documented, for example, scenes of a group of revolutionaries venting their anger on a member of the secret police (AVO), or how crowds of people in front of the ‘Szabad Nép’ printing works fought to get a copy of the first edition of the new newspaper ‘Függetlenség’. These photographs are not only invaluable historical documents, but also iconic examples of documentary photography. We feel honoured that, since 2014, we have been permitted to show the work of this photographer, who used a Leica for many years, in the iconic exhibition ‘Eyes wide open! 100 years of Leica photography’, which has toured the world and is currently visiting the World of Leica in Wetzlar.